A central heating system is one that heats your whole home from a single heat source by distributing the heat to all your rooms. The boiler is the main component of a central heating system that produces the heat, which is transferred around the property to keep you warm and cosy. What are the components of a central heating system? There are various different types of central heating systems. The most common types are known as wet central heating systems, and feature traditional radiators heated by a single heat source such as a gas, oil or electric boiler, heat pump, etc.. There are many variations as to how you can heat your home such as: underfloor heating; traditional radiators; or wall-mounted / floor-mounted heat emitters for heating & cooling. Our surveyor can go through all your requirements and advise you of the best solution for your needs. The system is controlled by various types of thermostats which could be hardwired or wireless smart controls. 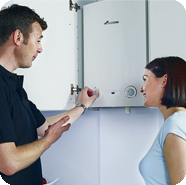 For more details on how the different types of boilers work, see this informative page hosted by Worcester Bosch. How can LOGIC help with my central heating system needs? Logic can design and install a bespoke cost-effective, energy-efficient central heating system specific to your home and needs, keeping you warm and cosy. We will carry out a free no-obligation survey where will go through your specific requirements and leave you with a quotation with the various options available for you to review. If you decide to go ahead, we will send one of our directly employed, experienced, friendly Gas-Safe-registered installers. For more details on how the buying process works, see our Logic Customer Journey page. If you are thinking of upgrading your radiators on your central heating system or installing a whole new central heating system, call Logic on 01228 598000 or 017683 51812 to discuss your needs with one of our experienced customer service advisors, and to book in a free, no-obligation survey of your property and costing. We look forward to your call!